Luigi was a highly prolific artist creating many hundreds of fine etchings depicting both European and American scenes. From phenomenal bustling cityscapes to breathtaking landscapes; he was truly a master of both genre capturing the highly realistic and aesthetic natural beauty that this world provides! Luigi Kasimir's body of work can be essentially split into two categories: European and American. While his European etchings fetch higher prices overseas his U.S. scenes more desirable naturally to American collectors. Kasimir came to the United States in the late 1920's and created many works until the early 1930's. Visiting the worlds most famous city of the time, New York City, Luigi uniquely captured this fabulous time period for the Big Apple and its iconic architecture. I will begin this page with Luigi's New York etchings showcasing which has now become some of his most desirable prints he ever created and then after move westward. Kasimir's "Brooklyn Bridge" (image 1-1) has for the last 20 years has been one of his most desirable prints and deservingly so with tug boats discharging steam in the East River, Brooklyn Bridge in the center and the staggering silhouette of Lower Manhattan towering in the background. This etching was first printed in a numbered edition of 100 and then an open edition followed. The edition of 100 is numbered in the lower left corner and signed in the lower right corner. For the open edition etchings Luigi moved his signature from the lower right corner to the lower center. This remains true for nearly all his prints and how he chose to sign / number them. This is one of three etchings depicting the Brooklyn Bridge. "New York from Governors Island" (image 1-2) has always been a personal favorite of mine because of the head on view we get of Lower Manhattan. Not only do we get this unique positional view but Kasimir decided to work into this scene natural vegetation with the grass, green hedges and three leafless trees. 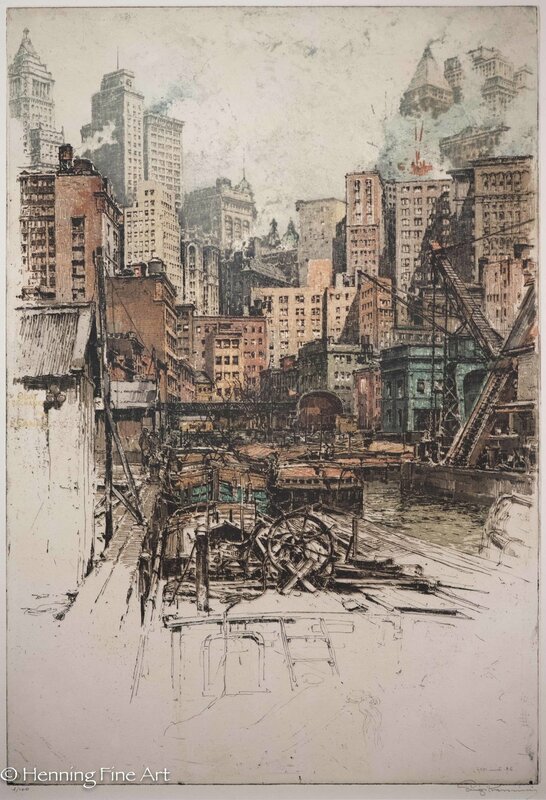 Most of his NYC etchings are strictly the city and its people, very industrial. But here we see the artist create almost a natural frame of the city within these trees and shrubs really showcasing it in an exclusive way. In 1936 Kasimir etched the "Queensborough bridge" (image 1-6) but this time looking at the underside of the bridge with docked sailboats and Lower Manhattan visible through their masts. The example below had been stored flat, out of direct sunlight and never framed which preserved all the images color. The tug boat puffing steam heading down the river is a bright red with the two docked boats being blue and orange. Many examples of Kasimir's prints are terribly faded due to being framed and displayed with non conservative glass; fortunately good restoration can bring the prints color back to life! "Brooklyn Bridge, Cable Bridge" (image 1-4) Is a stand out example of Luigi's Brooklyn Bridge depictions because it does not showcase the entire bridge from afar but from the bridge itself. Looking at one of the bridge's 130 foot towers the viewer can see Manhattan through its tall archways and off to the left. The detail of the bricks the tower is constructed from and the inter twining steel cables creates a stimulating print that confidently strays away from his usual works. The last of the three Brooklyn Bridge images (image 1-5) shows the entire bridge again but this time from a lower viewpoint. This view is from the boat yard looking more up at the bridge compared to being equivalent to the level of the bridge. All three images are highly attractive and look fabulous when hung together.